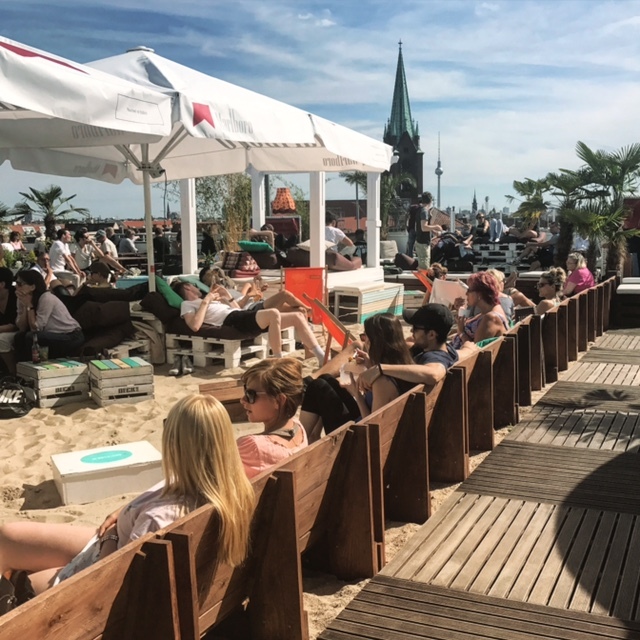 It feels like summer has arrived and Berlin does summer vibes like no other! Do not listen to the grumpies…it does get sunny and warm! 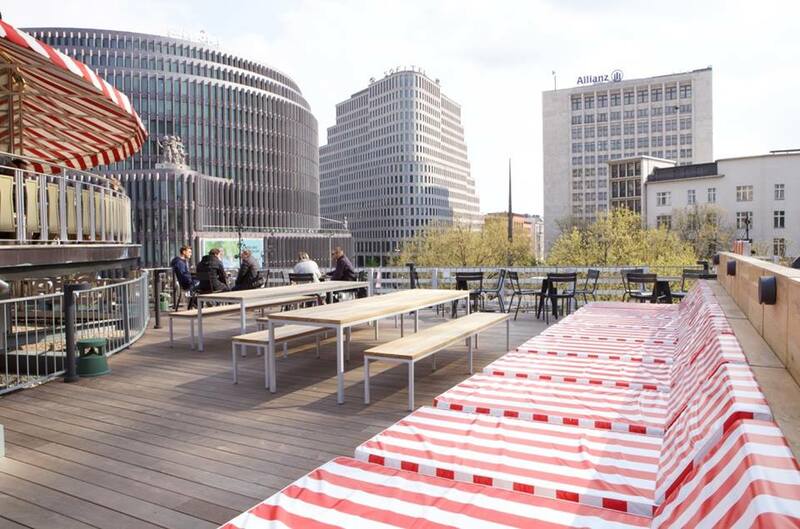 We love soaking up the sun, drinking a few cocktails, people watching and feeling the great city vibes. And we are happy that we can pick and choose from quite a few great rooftop bar options (depending on our mood and company). We love them all. Whether you like it fancy, hipstery, cheesy or cool, we have an option for you. 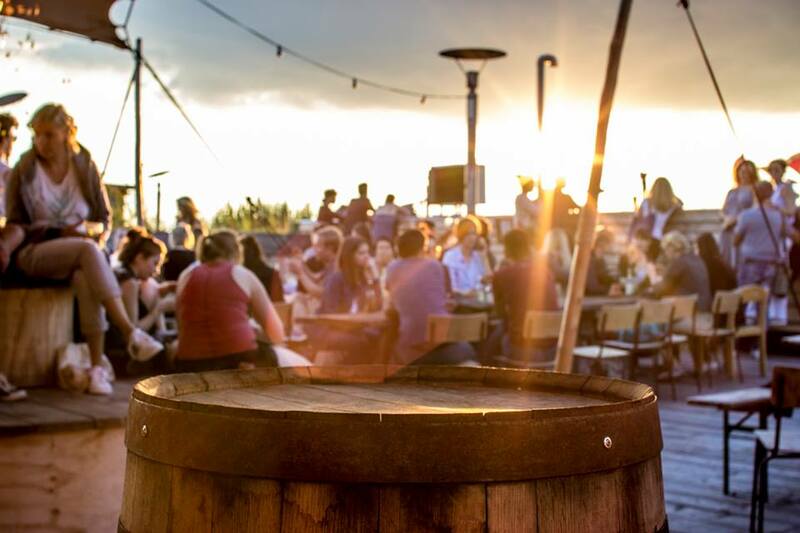 The best rooftop bars in Berlin have one thing in common, though. They all provide great views over Berlin. And nothing beats that! Most bars can be visited in the afternoon and in the evening. For chill vibes go in the afternoon and during the week. For party vibes, go in the evening and on weekends. Soundowners tend to be busy! Some bars do charge $$ after a certain time of day, so check their websites for details. 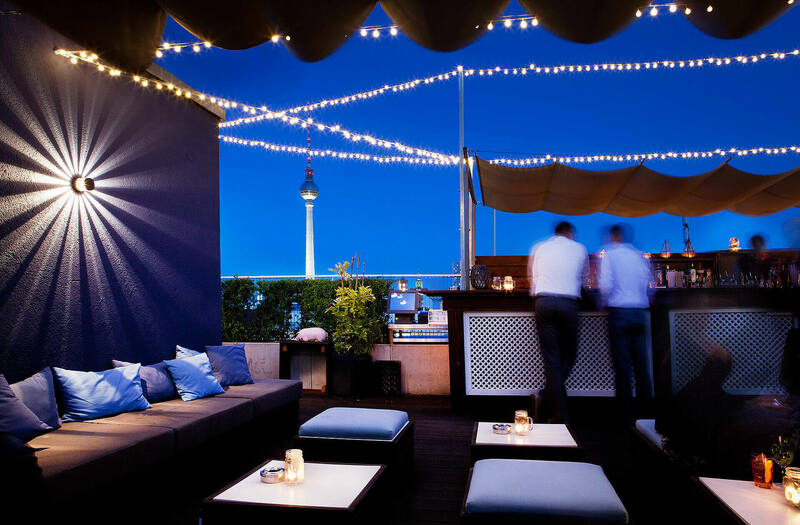 Located on top of a cool hotel in the heart of Mitte, Amano Rooftop Bar is a magnet for the Berlin Mitte hip crowd. The rooftop area is stylish and comfortable and the space has an overall loungy vibe. Great views over Mitte rooftops. Klunkerkranich used to be a secret a few years back. It is located on top of a mall’s parking lot in Neukölln. This rooftop bar has some of the most iconic views over Berlin. Vibes are casual and fun. It can get overrun with a younger hipster-toursim crowd at times. Come here during the week and before sunset for more of a “local” and chill experience. 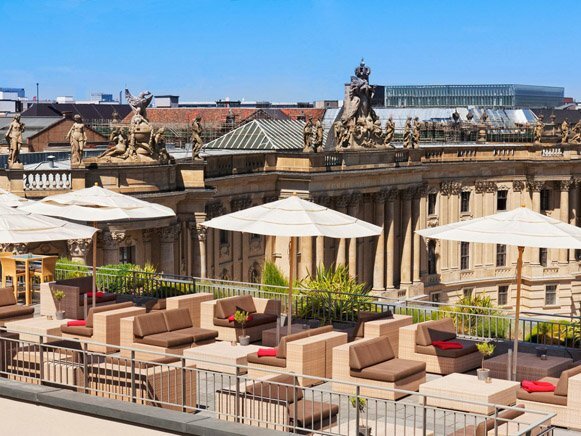 Overlooking Bebelplatz in Mitte, this fancy rooftop bar has stunning views of some of the most engimatic Berlin landmarks. The crowd is mixed and tends to dress up a little more than the other options. This is a perfect rooftop bar for a special occasion or to bring that 30-year-old+ friend from out of town. Deck5 is the Prenzlauerberg version of Klunkerkranich in many ways. It occupies the rooftop of a small shopping mall’s parking lot. This one, however, along Schönhauser Allee. Unlike Klunkerkranich, Deck5’s crowd is quite mixed and less hipster. Parts of it feel a little beachy (with sand on the floor). Take your shoes off, grab a drink and enjoy the sunset with a view! Overlooking Ku’damm, Berlin’s main shopping artery, Café Kanzler was taken over by one of Berlin’s most respected coffee roasteries. That’s right, this is not a typical “bar”…it’s a “coffee bar”. Get it? Grab a coffee and a delicious pastry and hang out at their very atmospheric outdoor seeting area. Photo from The Barn’s Facebook Feed. 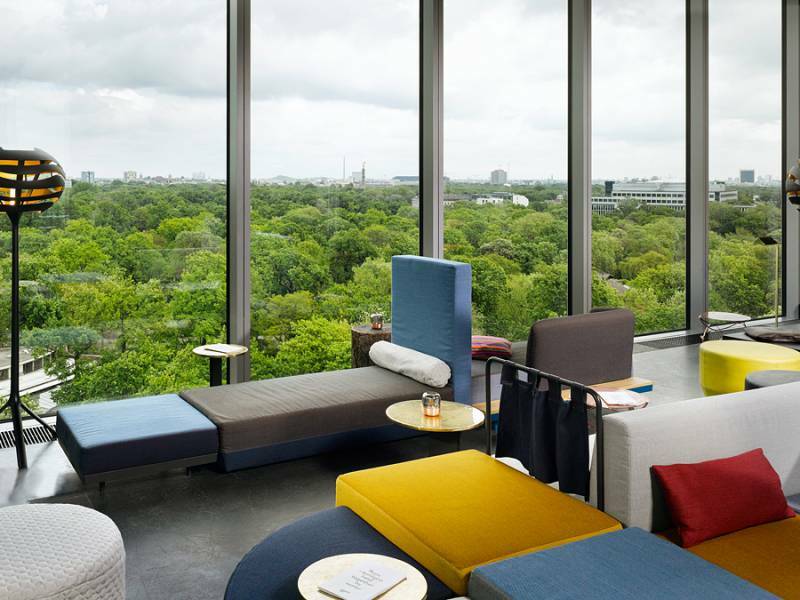 Overlooking Tiergarten and the Berlin Zoo (hence the name), Monkey Bar has, by now, become a West Berlin must-stop. The space is beautifully designed. The crowd is a mix of tourists, hotel guests (the bar is located on top of Hotel 25), and occasional locals of all ages. Come here on “off peak” hours for a better overall experience.